Supernatural - How's It All Coming Together? 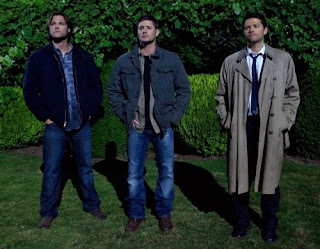 As we're six episodes in, and in the middle of what seems to be a bridge for a three-episode arc, we're starting to lay the groundwork for what will be this season's storylines for Supernatural. However, with the number of plots that have already been set up, the fans might be wondering how they'll all tie together. Sam Has No Soul: Not like we didn't see that coming, but the question now becomes who has Sammy's soul? It doesn't appear he parted with it willingly, so how did he and his soul get parted? And will he get it back soon? Because the Soulless!Sammy rendition is ultra-creepy. Hello, Sociopath, thy name is Sam Winchester. What's Up With The Campbells: Grandpa and the cousins are creepy. While I'm not sure if the cousins are deeply involved in the ultimate mystery, or simply following Grandpa's orders, I'm more concerned with Samuel. He's taking orders from someone, as we saw, but who that mysterious figure is we have yet to find out. Alpha Creatures: This was, to my understanding, what the overall arc of the season would be. All the supernatural creatures that they've been hunting over the years have to have originated somewhere and this storyline sets forth to tell about these origination myths. More importantly, we get to see the Alphas, the ultimate father/mother of each creature. There's A War In Heaven: When Cas sees fit to make an appearance, he reiterates the fact that he's a solider in what has become a full-on war in heaven. After the apocalypse, everything's in disarray. Angels are off buying souls and some very important weapons have gone missing. How will it all resolve itself? And will others have to die in the process before the battle is won? Four separate threads that have begun and likely will intersect in some manner to tie everything together. The question is, how? We can theorize and guess, it's a fandom way-of-life, because it's fun when we're right and it's even more fun when we never see it coming. My theory, subject to change with every new episode, is that in the end all four plot-lines will lead to a single one. The Soulless!Sam issue is one we'll see in this Friday's episode. Remember the Alpha Vamp or whoever he is that Dean saw in his dream? The previews seem to reveal a bit more about him and prove that he is indeed real. Even though implications are that he was the one behind the soullessness to make Sam a perfect weapon, I'm not so sure he's the top-level guy in all of this. Balthazar is an angel buying souls because they're hot commodities. That leads me to believe that there's a higher-up buying them from the various angels who are dealing. Is the higher-up an angel trying to be the ultimate boss of a heaven currently in disarray or is is a demon, perhaps a certain King of Hell called Crowley, who wants to reign supreme above and below? Whoever he is, I think he's the one that's currently got Sam's soul. I also think this unseen figurehead is the one giving Grandpa Campbell his orders and charging the elder hunter to gather all the Alphas he can find. What ultimate plan does this leader have that involves human souls, Sam's soul, and the origins of all the supernatural creatures on Earth? It could be final destruction. Amass an army of soulless people to do his bidding, while taking out the Alpha of all the creatures, leaving the need for a new leader of them all. In steps Mysterious Guest #1 and he's ruling the entire world; above, below, and here on Earth. It's a cunning plan, a plan worthy of my favorite demon Crowley, but the confirmation of whether or not he is indeed behind all this has yet to be seen. I've showed you mine, now show me yours. What are your theories of how it all ties together? Who has Sammy's soul? Why is Grandpa so creepy? What's up with all those Alphas? And can the war in heaven ever come to a good end? I know I'll be eagerly watching as it all plays out.